The urban jungle inspires all the parties; from underground Bushwick basement raves to sunset dance-offs at Output rooftop, NYC is always chasing after a good time. As summer winds down, we’re excited to see the local dance scene explode. So put on your dancing shoes and grab your best friends – this is going to be a boogie kind of ride. Organized and influenced by NYC residents who make the annual pilgrimage to Burning Man, Taste of Dust: Urban Oasis spans across two massive venues, all day and all night. A diverse musical lineup including artists like Stacey Pullen and DJ Three promises to keep the beats flowing. You’ll also find yoga, flow classes, guided meditation, fire performances, guest lecturers, interactive art, large scale sculptures, and more. Snag tickets here. 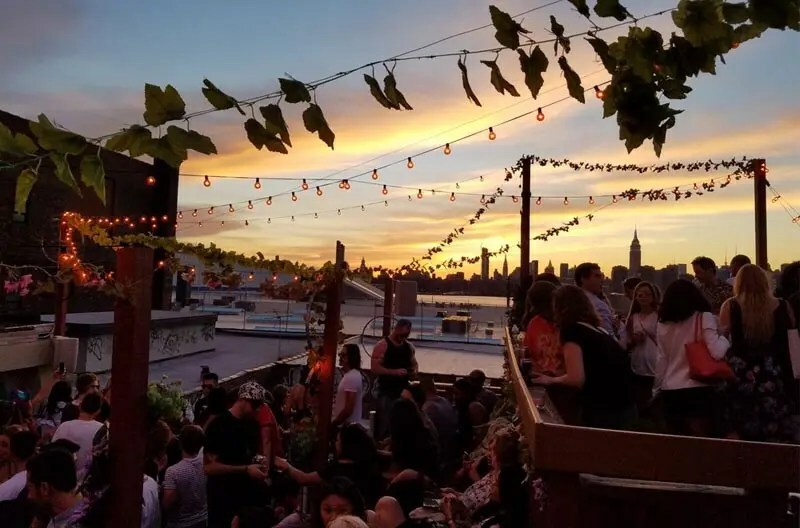 Through September 4th, Output Sunday brings the best techno, funk, house and disco DJs to its rooftop canopy bar, boasting great views of the east river and Manhattan. With tickets available here and a future lineup including Jus-Ed, Jay Daniel, Monty Luke and more, it’s exactly the kind of amazing rooftop dance party you’d expect from the famed converted warehouse nightclub. 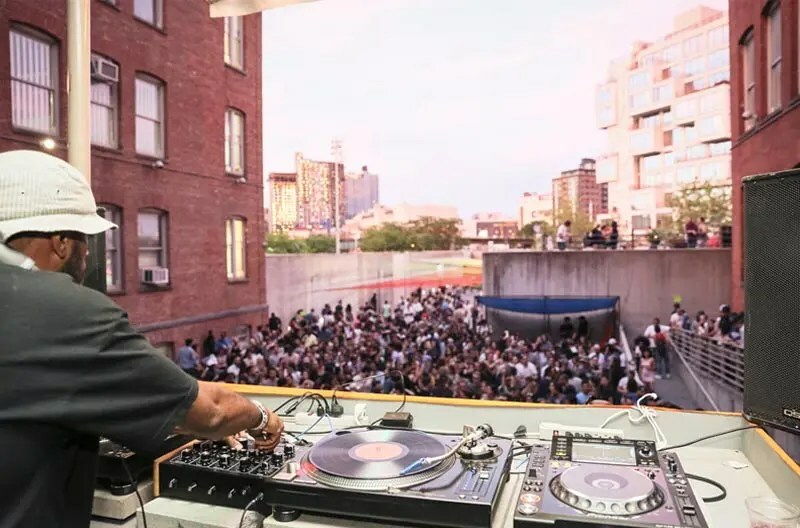 Taking place every Saturday until August, the Museum of Modern Art’s PS1 presentation of Warm Up is a must-attend for everyone who digs experimental music, live DJs, and heart-pumping sound. 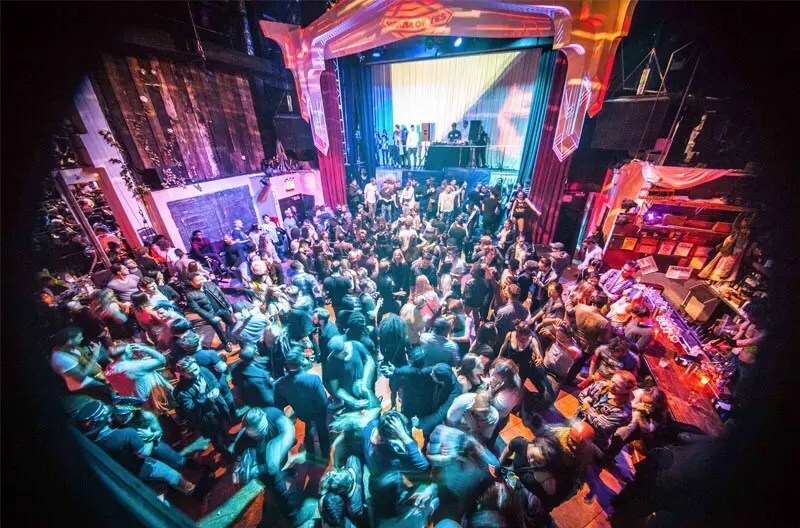 From local and international DJs (including Skrillex, Theo Parrish, Endgame, and more—check out the full lineup here) comes the latest in spin for a collaborative and rotating event that brings new sounds every week. Located in MoMA’s PS1, tickets start at $22 a pop. With world-class DJs in the lineup at Lazer Brunch (more on that here), Hudson Terrace is no stranger to hotter-than-hot parties that happen on its rooftop lounge, and Sunset Fridays are no different. With two-for-one cocktails and music ranging from EDM and dance to Top 40 and hip-hop, this weekly let-loose event is the perfect end of summer cocktail. To get a jumpstart on the tunes, check out DJs like Noahstradamus before you hit the scene (international listeners, get around the geo-location blocks with the help of a Virtual Private Network or a VPN) and you’ll not just be bouncing along to the great beats but singing along too. Dig the West Coast vibe, but don’t have the time and/or cash to make the trip next weekend? No worries, we got you. Pencil in August 20th as the day you’re going to be doused in Dre and Snoop beats because this is one secret party you don’t want to miss. With the latest DJs mixing new grooves with classics, and everything from temporary California-inspired tattoos to a hologram Tupac, Str8 West Coastin’ is one of our favorite end of summer Brooklyn parties. Pro-tip: RSVP and show up early to take advantage of the complimentary rum and punch from 2 p.m. to 4 p.m. Celebrating its 6th year, Full Moon will transform Governor’s island into a two day oasis complete with music, art installations, and panoramic views of the statue of liberty and Manhattan. For the first time, the event has been expanded to two days. Beachside tunes include EDM and indie/pop inspired jams coming from SBTRKT, Santigold, Pusha T, and more. View full lineup and tickets here. The Roots Picnic is the brainchild of hip-hop group The Roots and began in their hometown of Philadelphia in 2008. Making its move to Bryant Park this year—probably in honor of the Roots’ recurring collab with Jimmy Fallon and an homage to their new city—The Roots Picnic on October 1st and October 2nd is a great way to greet cooler weather with an amazingly stocked set list of performers. Bringing in D’Angelo, Wu Tang Clan, John Mayer and more to New York’s second most famous park, this weekend jam session is the perfect beginning of the new season and excellent way to say goodbye to the long summer days, so grab your tickets early here. Cassie Phillips is a digital nomad and entertainment guru dedicated to living her life from one concert to the next. She’s a huge fan of the Big Apple, and these are the top hits on her calendar of music scenes to check out in 2016. To send her comments and recommendations on where to listen and dance next, leave her a shout-out below.